Increased the default range of Azazel's Brimstone Tears are replaced by a laser beam that pierces through all enemies and obstacles in its path and deals high damage. Can only be fired after a short charge-up period.. 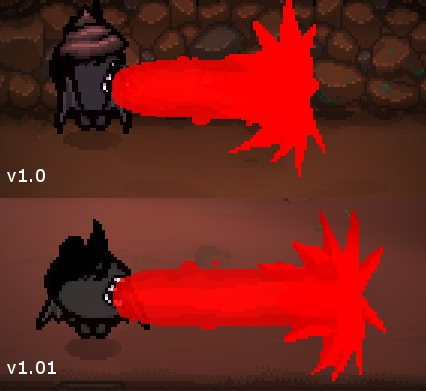 Improved the effect of Range Up items on Azazel's Brimstone Tears are replaced by a laser beam that pierces through all enemies and obstacles in its path and deals high damage. Can only be fired after a short charge-up period.. Decreased Dark Bum Spawns a familiar that follows Isaac around and collects red hearts. For every one-and-a-half red hearts collected, Dark Bum will generate one soul heart, one hostile Spider or one friendly blue spider. 's heart conversion rate to approximately a 1.5:1 ratio.